Wave buoys have been essential in providing accurate ocean surface measurement since the middle of last century. The costs associated with maintaining them, though, can be astronomical. Dry sensors provide a solution to this expensive, and potentially hazardous, problem. Wave buoys are used to measure movement on the surface of the world’s oceans. They provide data about the height of waves, how frequent those waves are, and also the direction that waves are travelling in. Collecting surface data using buoys has been a staple of ocean measurement since the middle of last century. 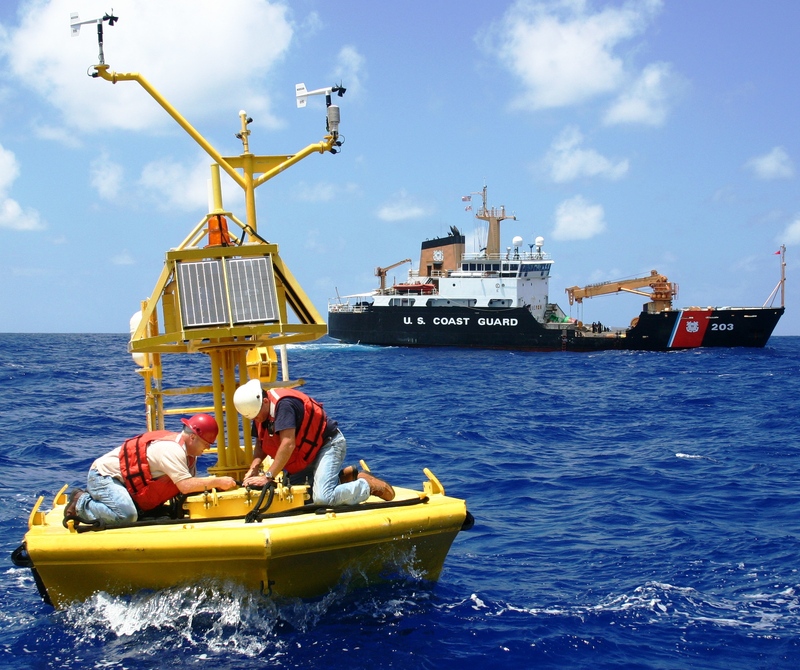 Wave buoys and weather buoys provide information for marine and weather forecasting, safety at sea, and climate prediction. The data can also be used during emergency response to chemical spills and even as evidence in legal proceedings. Despite their uses, the costs associated with purchasing and maintaining wave and weather buoys can be considerable. Current estimates suggest hire costs of up to US$170,000 per year, per buoy. Additionally, a single trip to fix a failed buoy can cost up to US$25,000. The associated upkeep can also be hazardous for the individuals involved in the cleaning and repair regime. Biofouling is one major influence on the scale of the financial cost. It amounts to more than US$5.7 billion of spending every year across the globe. This building up of microorganisms, plants, algae, or animals on wetted surfaces can greatly impede the accuracy of information produced by wave buoys and other in-ocean equipment. The process of cleaning affected buoys can involve divers or simply bringing the buoys on ship for a full clean and service before redeployment. Both routines involve several hours of labour performed by multiple personnel. These are just some of the expected issues related to wave and weather buoys, but there are many other factors that can drive up the costs. It’s not uncommon for buoys positioned in areas of predictably wild weather to be brought on land during certain periods of the year. This is to reduce the vulnerability of being lost when tethers break under the strain of extreme wind and wave activity. Nevertheless, it’s not uncommon for buoys to vanish during storms. This is far from an ideal outcome. Beyond the naturally-occurring impacts, human intervention can play a troublesome role in buoy maintenance too. NOAA scientist Michael McPhaden has given notable examples of the kind of damage and vandalism that frequently takes place. Buoys are found tangled in fishing equipment, damaged due to collisions with vessels, or simply stolen. Despite warnings and attempts to better inform seafarers about the importance of wave buoys, efforts have proven insufficient. Wave buoys have even, on occasion, been held hostage after being found and “salvaged” while adrift. Schools of fish tend to gather around buoys, so fishermen often anchor off them. All of these occurrences add to the wear and tear of equipment. Looting is also a major issue in some areas, with the potential to render equipment completely ineffective. This can be particularly worrying when wave buoys make up part of early-warning systems, such as those associated with tsunami detection. Access to accurate weather data is important. Fully-functional wave buoys are often found to be part of the related infrastructure. Maybe you’re getting a service vessel to an offshore platform? Perhaps you’re sending divers to deal with a biofouling issue? Or maybe you’re relying on data to forewarn disaster? In territories where tsunamis pose a threat, buoys play a major role in raising the alarm. Despite this, buoys have often been found to be broken. In fact, towards the end of 2018, Indonesia was hit by a major earthquake, triggering a tsunami. A spokesperson for Indonesia’s weather, climate and geophysics agency revealed that all 22 tsunami buoys had been broken since 2012. The buoy system cost an estimated US$2.3 million to maintain every year and the funds simply weren’t available. Miros has spent 35 years developing and installing dry sensors to measure the ocean surface. Our products are used across the globe, delivering accurate, real-time ocean data to the individuals and teams who need it, without any wet equipment whatsoever. The Miros Wave and Current Radar collects sea state information including wave parameters, wave spectrum and surface currents. Furthermore, it does so with the same data quality as a high-performance buoy. All that’s needed is a power supply and an Internet connection, with data made available to any device in real time through the Miros Cloud. Dry solutions, such as those offered by Miros, have the potential to significantly enhance the safety, sustainability and performance associated with ocean surface measurement. Find more in-depth information about the Miros Wave and Current Radar here. Photo credit: Officers and Crew of NOAA Ship PISCES, Collection of Commander Jeremy Adams, NOAA Corps; NASA ICE via Wikimedia Commons.